Welcome to our Federation Webpage! The EFGOCM has served the parishes in the Metropolis of New Jersey for over 35 years as a resource to our church musicians. EFGOCM supports our choirs through workshops and conferences and provides resources to enrich and enhance our musicians. EFGOCM supports our psalti through workshops and resources to preserve our beautiful byzantine chant. EFGOCM supports our clergy to improve or enhance their parish music ministry program. EFGOCM supports our youth programs to help establish youth choirs and hymnology in parishes. Navigate around and you will find the latest information on upcoming workshops, concerts, our annual conference, scholarship information, archived photos, awards, and resources; and read the latest (or archived) version of The First Mode (our newsletter). Let us know if there are initiatives or directions you would like to see us begin, continue or just improve on. We look forward to your continued participation in our Federation. 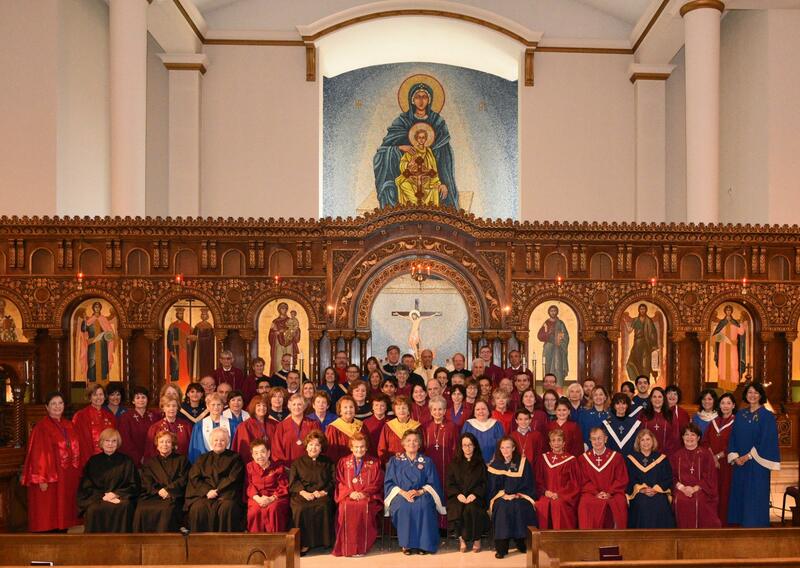 Participants at the 2018 EFGOCM Conference at SS Constantine and Helen Cathedral in Richmond, VA. Click Photo to enlarge. It is with great joy that I greet and welcome you to the official website of the Eastern Federation of Greek Orthodox Church Musicians for the Greek Orthodox Metropolis of New Jersey. I am confident that this vital website will provide timely information with regards to the events and activities of the EFGOCM as well as afford all visitors the opportunity to learn more by delving into our Church's rich hymnology. I congratulate all who are either Psaltoi or members of our Church Choirs for the wonderful and inspiring work done to serve our Lord, while at the same time edifying the Orthodox Faithful with their melodious chanting. It is also my sincere prayer and desire that the angelic voices of our Youth Choirs throughout the Holy Metropolis of New Jersey will continue to grow and inspire all of us. Indeed, in offering your praises to God, we are reminded of the words of St. Paul, "...but be filled with the Holy Spirit, speaking to one another in psalms and hymns and spiritual songs, singing and making melody in your heart to the Lord..." (Ephesians 5:19) May St. Romanos the Melodos, Patron Saint of our Church Musicians, intercede to Christ our God for their continuous health and well being, as they minister to our Orthodox Faithful in the most important area of Church Hymnology.